The Airistech Mystica Mini Kit is new and improved mini version of the Mystica cartridge battery device that now features a lightweight body and automatic firing method for easy use on the go. Measuring in around 1/8th of an inch smaller in height and width than it's predecessor, the Mystica Mini utilizes a smaller housing for improved portability. Airistech replaces the all metal body with a more lightweight yet just as durable construction that adds to the Mystica Mini's portability, throw in a pant's or jacket pocket and no one will have a clue you're carrying around a vaporizer. This compact vaporizer kit is stocked with a removable and refillable essential oil cartridge attachment that features a leak-proof structure. This heating attachment can be replaced by most other similar 510 threaded essential oil cartridges currently on the market (measuring up to 10.5mm in diameter). 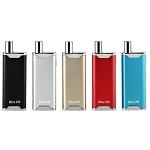 Just as it's predecessor's the Mystica Mini utilizes the innovative magnetic adapter system to create a connection between atomizer and battery and it can hold up to around 0.8mL of thin oils at a time. 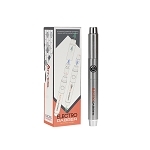 Airistech includes two of their mini magnetic adapter rings with this kit, allowing you to leave one on each of your cartridges to ensure each attachment is ready to go whenever you may need it. Once one cartridge is empty and you are ready to replace it, simply pull it out of the Mystica Mini's housing, drop a new one in it's place and the magnetic adapter's will do the rest, it is just that simple. 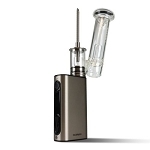 This edition to the Mystica Vaporizer series features a unique automatic firing mechanism that removes the need for any buttons, truly creating the most convenient vape experience possible. When you are ready for a quick and stealthy vape session simply attach your filled atomizer and begin inhaling. The internal components will automatically detect your inhale and begin heating the cartridge until your inhale has finished or until the device has fired for a continuous 10 seconds. After 10 seconds of continuous use the Mystica Mini automatically kills the power to prevent overheating and to preserve battery life as well as your thin essential oils. Airistech's Mystica Mini Vaporizer also features an embedded 280mAh lithium-ion battery that features a convenient micro-usb charing method with pass through charging that allows you to continue vaping while you recharge. 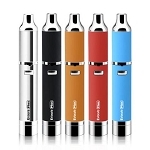 An atomizer window can be found on either side of the device that allows you to simply glance down and get an accurate idea of when it will be time to refill next. Also on the bottom of the device you will find an LED light indicator that will help to take the guess work out of your vape game, while the device is firing properly or when a full charge has been achieved it will shine a solid red color. I already had one of these and loved it. I recommended it to a friend which led me here. I bought two, one for me, one for my friend. The one I kept for myself hasn't worked sinceI got it. The coil is broken and doesn't heat up.